A series of events is under way to mark the 175th anniversary of the birth of Galloway physicist James Clerk Maxwell. He is recognised as a scientist who helped to shape our understanding of many aspects of the modern world. The most significant of his many achievements was identifying and writing the equations of the electromagnetic field. That made possible technology such as the mobile phone, satellite communications, radio and television. 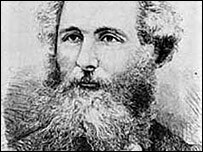 Born in Edinburgh on 13 June 1831, Clerk Maxwell's family moved to Glenlair near Corsock when he was a child. He went on to rank alongside the likes of Albert Einstein and Isaac Newton in the field of scientific discovery. Clerk Maxwell spent most of his life at the family estate and is buried at nearby Parton Church. His biographer Basil Mahon is among the speakers at events to mark the anniversary. Mr Mahon said the man deserved his place alongside the all-time greats. "He changed almost everything in physics," Mr Mahon said. "He came up with a number of completely new ideas in physics that were very strange to the people of the time but are completely normal now. "I think you can certainly put him with Newton and Einstein in the world of physics. "I think if you speak to any top physicist they would agree those are the top three and he doesn't automatically take the third spot." The Galloway and Upper Nithsdale Conservative MSP Alex Fergusson is also an admirer of Clerk Maxwell. He has tabled a motion to the Scottish Parliament drawing attention to his achievements. "I look forward to that debate as a first step in getting the recognition that he is due in his native land - a recognition that is already accorded him in many other countries," said Mr Fergusson. "He is a truly great Scot and it is time he is recognised as such."